Fortunately, I did manage to catch a couple of dogs at the kerstmarkten the other weekend, and on this second day of Christmas (Tweede kerstdag, as it’s called here), I thought I’d share a couple of the photos. Because, dogs. 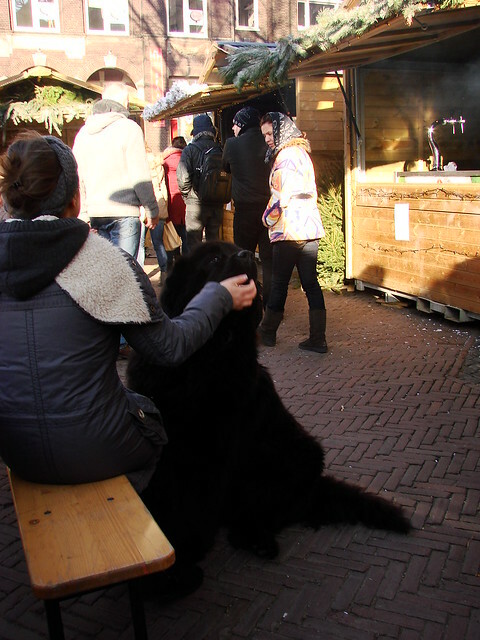 One of the first dogs we saw was this giant Newfoundland dog, AKA a Newfie. I knew these dogs were big. I’ve even seen them before in person, but it’s still easy to forget just how big a dog they can be. I don’t think the picture even gives the true sense, as he’s sitting down and fairly relaxed. I just wanted to throw my arms around him and burrow my face into his fur. He looked like a giant teddy bear you just want to cuddle! 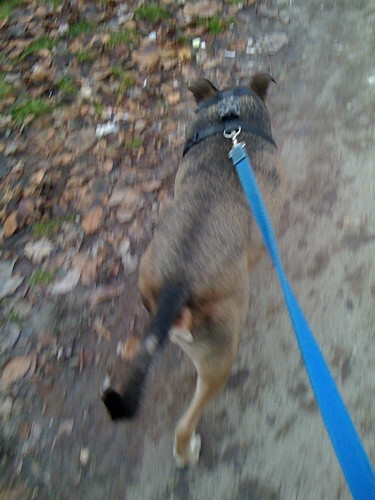 This next dog was all too familiar to me in his straining enthusiasm to lick some fallen morsel of food off the ground. Well, I say food, and in this case it probably was, but often it just has to be something that smells good to a dog. 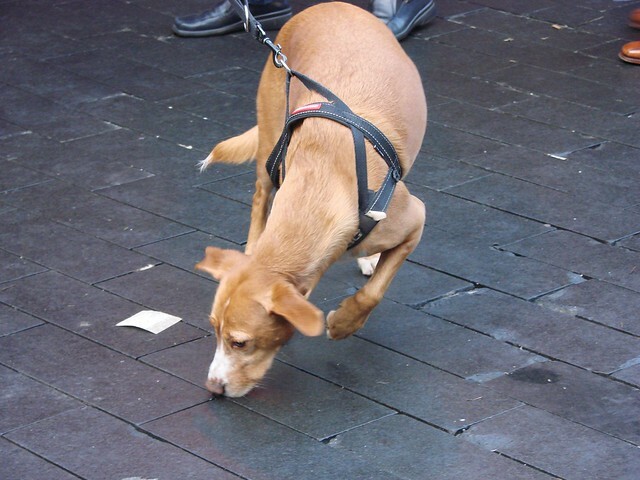 Imagine walking an enthusiastic six-month-old dog through the streets of New York and all the inevitable stuff that littered the ground, edible or not. 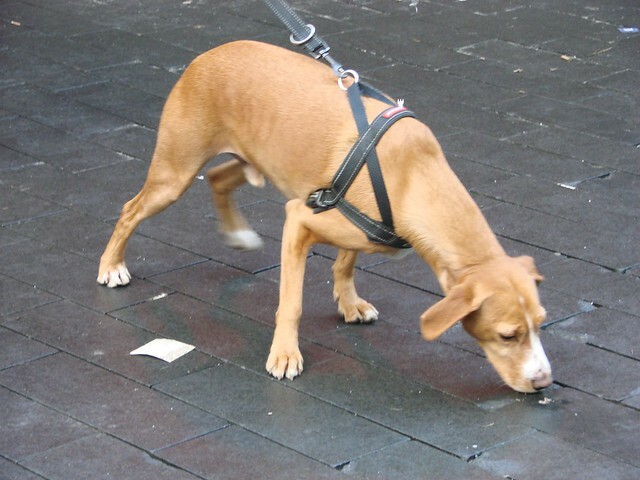 I still remember the game of tug of war when it came to keeping my Pippo away from a dropped slice of day-old pizza on one of our morning walks through Manhattan. 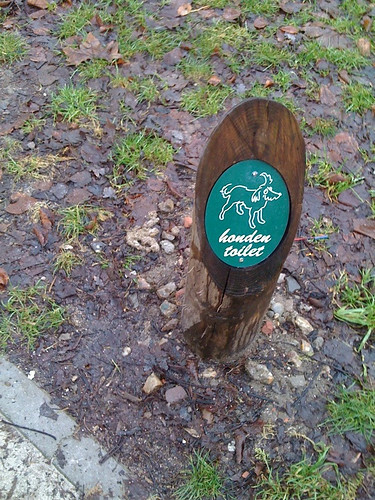 This little fellow managed to lick up whatever had fallen, as seen by the round wet mark just to the right of the dog in this next photo, before continuing his scavenging. 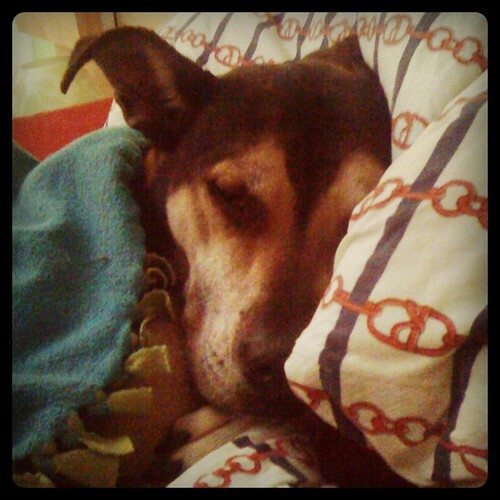 It’s been just over two years since we lost our sweet Pippo, an enthusiastic scavenger and licker. Our dishes just aren’t as clean as they used to be. In the process of trying to do something that didn’t work, I created a Facebook page for my blog. I like to keep my personal Facebook somewhat personal, but figured it could be handy to have a Facebook page for the blog as another way to interact with people and also pass along interesting links and stories as I find them, but don’t necessarily have time or interest to actually blog them. So, feel free to “vind het leuk” on Facebook! 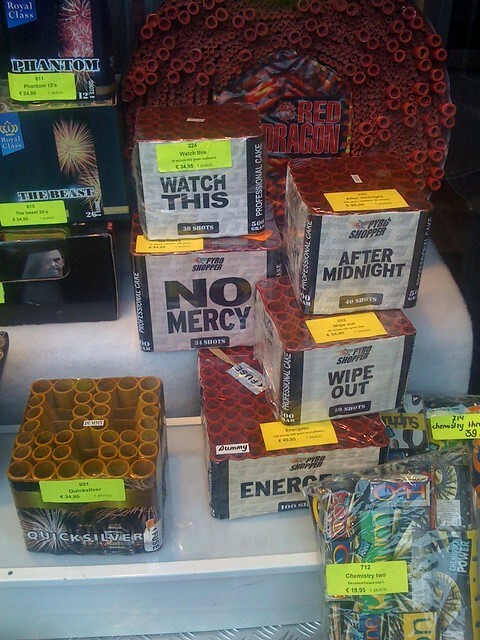 As I’ve said before, New Year’s Eve is the big time for fireworks in the Netherlands. Don’t be fooled into thinking it’s only at night or at midnight. Officially, they can be set off between 10 pm and 2 am, but in reality, they started going off about 7 am today. They’ve been pretty consistent ever since. They’re also getting louder as the day goes on. We’ve had a few close ones that sounded like major explosions in the past couple of hours. 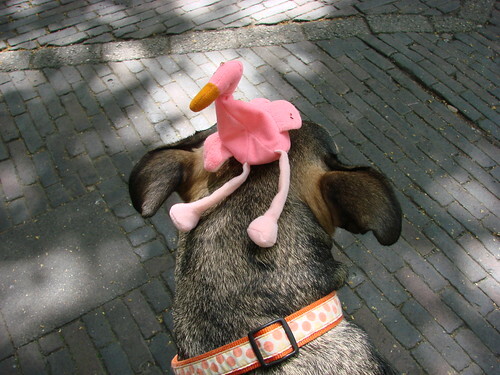 Pippo is getting tenser by the hour. Around 11:45 am, as the bells were ringing and the fireworks were exploding, I thought I’d record it to give you a hint of what it sounds like all day here today. All the cracks and bangs you hear in the background are fireworks. My camera isn’t the best for recording sound, but you get the idea, especially after the 45-second mark when it gets particularly consistent and especially at the one-minute mark. At the very end, you’ll see why we have a hard time fully enjoying the fireworks. As the bangs and booms continue, we’ve got ragu cooking on the stove ready to be made into lasagne for our dinner tonight. It’s become a tradition for us. We’re having a quiet night in and hopefully we’ll be able to stay awake until midnight. I hope you have a fun, injury-free evening, whatever your plans! It’s that time of year again. 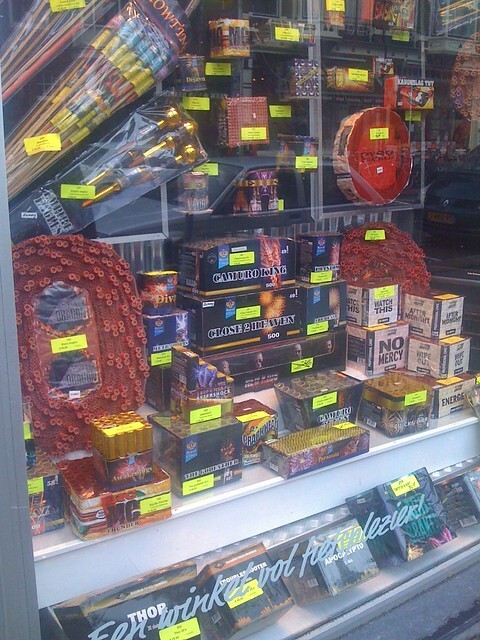 Today begins the official day when fireworks are legally for sale across the Netherlands. In theory, they’re to be saved until December 31/January 1, between the hours of 10 p.m. and 2 a.m. In reality, they’ve been going off sporadically for the past couple of weeks. 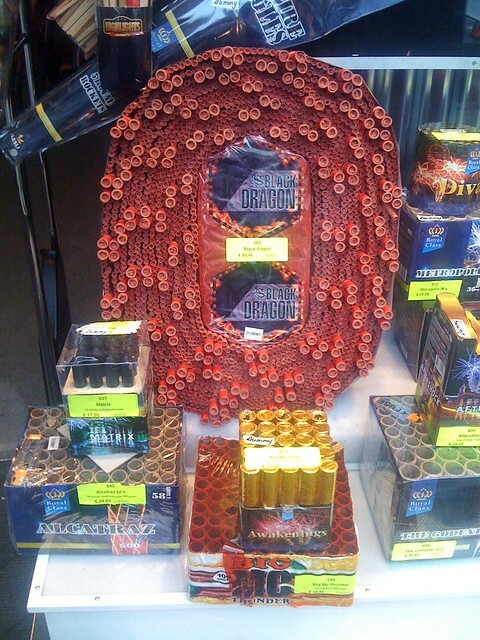 We were on Nachtegaalstraat this week and passed one of the bicycle shops, which seems to also serve as a licensed fireworks vendor. They had an impressive display in one of their front windows. Unlike the US, where fireworks are usually limited mainly to officially organized set events, here they are set off by your average Nederlander anywhere there’s space (or not) to set them off. And we’re not talking small firecrackers and the occasional Roman candle. We’re talking major starbursts and rockets and the kind of stuff I was only used to seeing at the official Fourth of July fireworks displays on the edge of town in the US. Here, I can see the same kind of display from my bedroom window. The Dutch spend a lot of money on it all, too. It’s estimated that this year’s sales will be around €65 million. In a country with a population of 16 million. Sadly, the population does go down in numbers every year as a result of fireworks-related accidents. 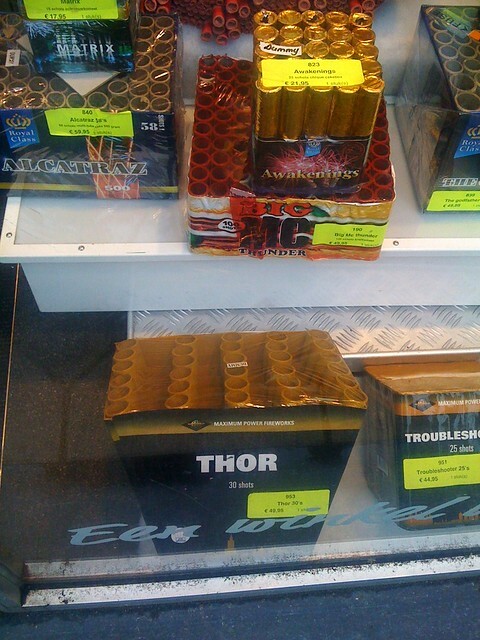 They’re trying to cut down on the number of illegal fireworks sold and there’s certainly a lot of reminders to be careful, but in the heat of the moment, things go a bit crazy. With all of the smoke from the fireworks, it truly does look like footage from a war zone. I love watching fireworks, but sadly, our dog does not. As a result, some of my enjoyment of them is lessened, because it’s hard to enjoy them when your 70-pound dog is quivering and panting in fear. We try to distract him, but sadly there’s nowhere to go in the house where he won’t hear them. No mercy is right, unfortunately. Spare a thought for Pippo this December 31. 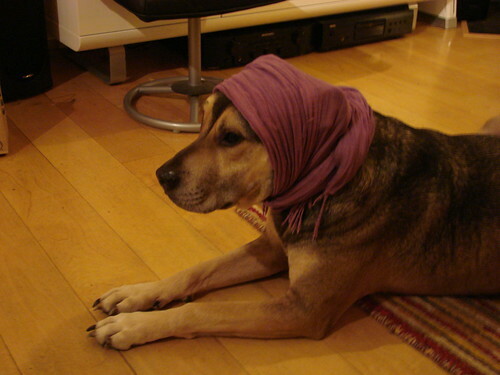 He’s not a fan of this holiday and a scarf over his ears doesn’t help dampen the noise. Trust me, we tried. The Netherlands doesn’t just celebrate one day of Christmas; they have Tweede Kerstdag, literally Second Christmas. That doesn’t mean you get a second day of presents, though. In fact, Eerste Kerstdag (First Christmas) isn’t even that big on presents, since Sinterklaas (Dec. 5) is the bigger gift-giving day. I’m not sure what the background/basis for the second day of celebration is, or if there are any traditional things done on this day. It doesn’t seem to be a big shopping day, either, as many of the stores are closed today. For us, it’s just an excuse to enjoy another fun meal. Tonight we’ll be doing another round of gourmetten. I think the cheap one we bought last week has more than paid for itself already! We used it first while my friend was visiting and we used it again after she left. It’s a fun way of grilling at the table and gives you a variety of different dishes to enjoy. Tonight we’re having chicken in Thai chili sauce, steak in a sesame/soy sauce, and mini slavink, along with mushrooms and red bell peppers. To round out this second day of Christmas, I figured I’d post a few more of the Christmas-y photos I took in Amsterdam last week. 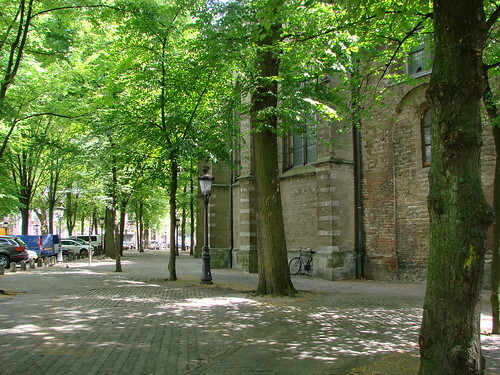 These were all taken around Leidseplein, an area I’ve gotten to know well due to seeing shows at Melkweg and Paradiso. 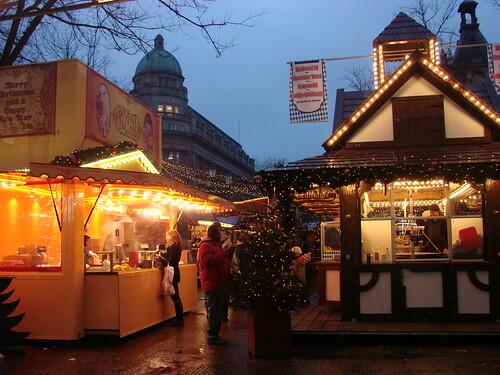 The first photo above is a small kerstmarkt (Christmas market) set up on one side. 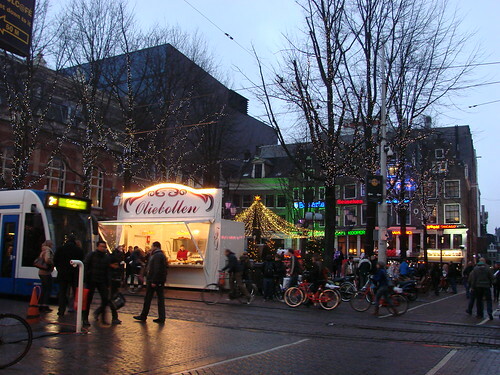 The second photo is the other side of the square and shows one of the many oliebollen stalls you’ll find throughout the country. The last one is just a side street with some of the typical lights you’ll see hung across the street. 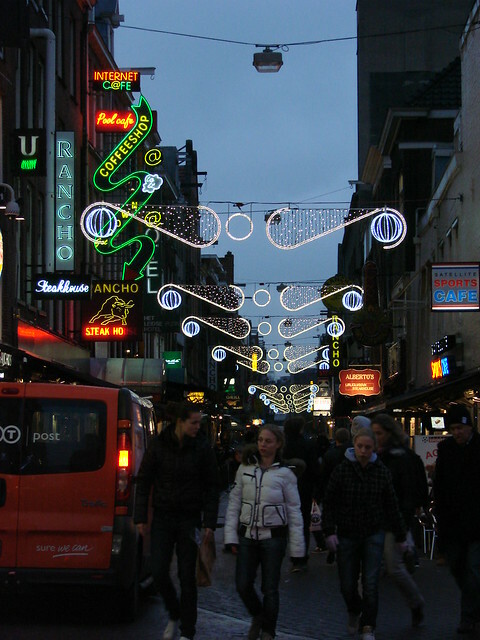 Many of the streets in cities and towns all over have similar lights, varying only in design. 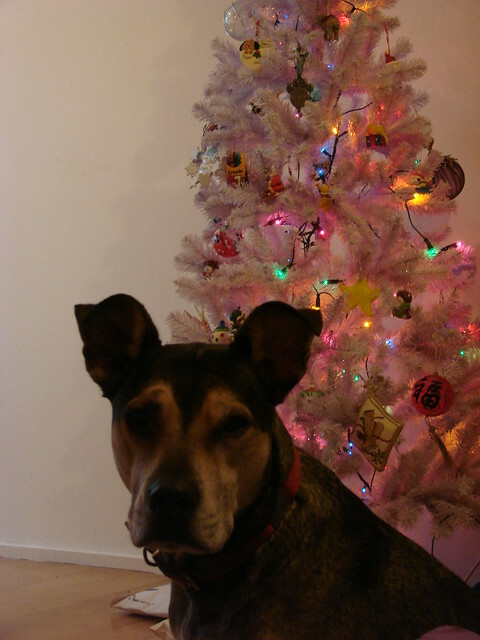 Oh, and one last photo of Pippo in front of our tree. Just because! 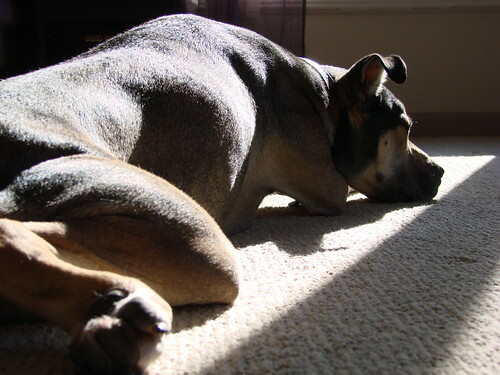 When I saw the topic of this week’s photo challenge, I figured I’d end up with a shot of one or more of our pets, since they make comfort into an art. But then I woke up Sunday morning and it was clear which pet would win the photo shoot. We woke up with Pippo wedged in between us, with his head on our pillows. 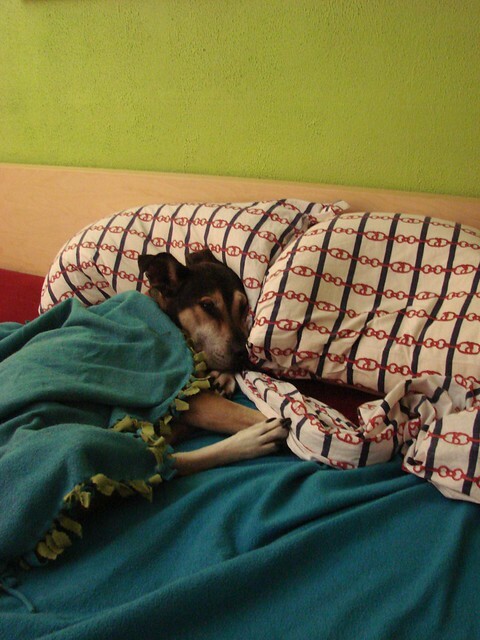 He didn’t move, even after we got up — and put his blanket over him. 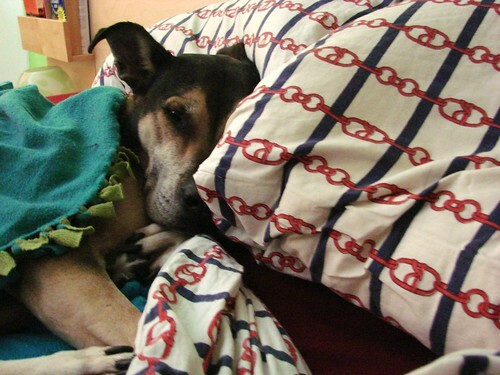 He was comfy and he wasn’t going to move until he had to, or until the call of breakfast became too tempting. 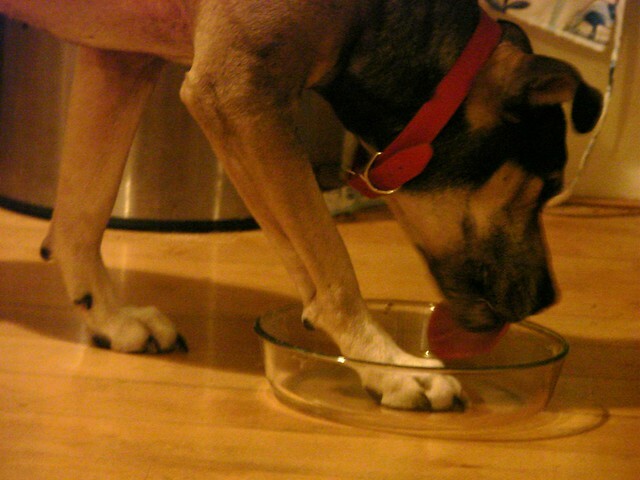 Notice all the legs and paws. Many of them were poking me in the back and are probably the reason I woke up when I did. He wanted to spread out a bit more. 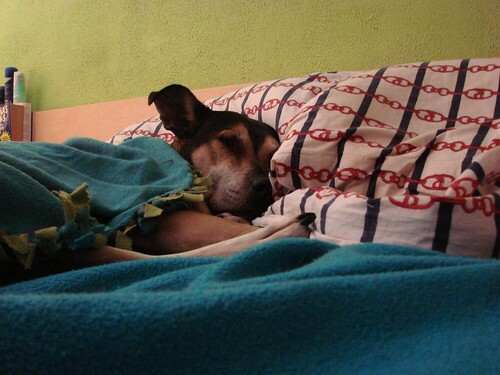 Regardless, this is a dog who knows his comfort! Why is ok for street sweeper machines to be out working at 8 a.m. on a Sunday morning, but god forbid a normal store be open? Pippo and I took a little walk before breakfast this morning and wandered through Janskerkhof. Despite the torrential downpours we’ve had in the past 24 hours, the scent of yesterday’s flower market still hung heavy in the air. The rain looks like it’s on its way back any minute now. We got the walk in just in time. 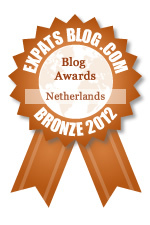 Today is Culturele Zondag (Ga Groen! ), but I’m not sure the weather will encourage me to leave the house again. Baking, on the other hand, seems like the perfect rainy-day activity. I think I’ll make a small batch of muffins with a little bit of chocolate and the handful of strawberries I have left. 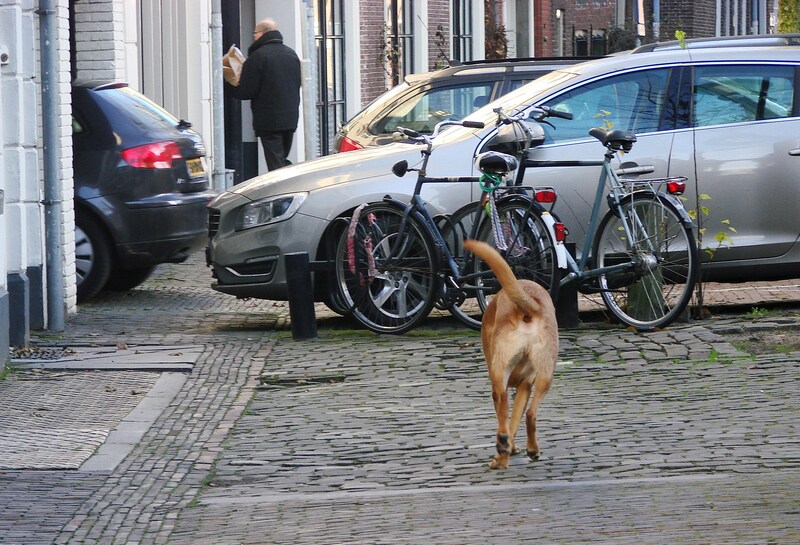 If you’re a dog owner in the Netherlands, this is a daily sight.